Release details were just revealed for this figure a few days ago and now Bandai of Japan has just released official images of S.H. Figuarts Rideron! Fans of Saban’s Masked Rider will undoubtedly recognize this vehicle as Magno, Dex’s trusty vehicle & ally. Rideron, like the upcoming S.H. Figuarts Tridoron, is another large scale vehicle release from Bandai. However unlike Tridoron, Rideron is indeed a retail release! Priced at 19,440 yen this massive machine will set you back but it also completes a Black/Black RX Figuarts collection for many collectors as the final vehicle in that subline. S.H. 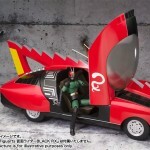 Figuarts Rideron will be released this November.